The United Nations has announced that it has invited Iran to be part of the negotiations to find a solution to the crisis in Syria. Iran was not invited to the first two meetings in Geneva because groups opposed to the Bashar Assad regime maintained that Iran supported Assad and they do not consider him to be part of the solution. 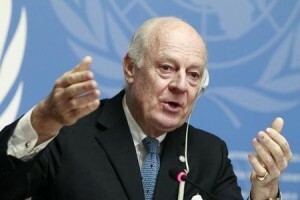 The United Nations Special Envoy for Syria Staffan de Mitsura is planning to meet with the various groups, including Syrian government representatives and opposition groups, in the next four to six weeks. The UN reports that while two influential groups, ISIS and the Nusrat Front, are not being represented at the Geneva meetings, other groups that are invited are able to communicate with them. The Syrian conflict has now entered its fifth year, and Staffan De Mistura is the third representative that the UN has appointed to mediate a resolution to the Syrian crisis; however, a resolution has so far remained beyond reach.